This life-size remake of the game is a blend of playing indoor soccer while mounted to a shish kabob. We have seen a variety of materials used to construct this game over the years from elaborate wood craftsmanship to large inflatable jump houses, but there is always one common theme — fun. Everyone likes to join a team and be competitive, which makes human foosball a great fit for team building corporate events all the way to children's birthday games. The game is very similar to foosball in that two teams are connected to rods so they can only move laterally across the court instead of up and down like traditional soccer. The ball is served between the two opponents in the middle of the court and players must kick the ball to other players on the same rod or advance it in an attempt to score a goal. Games are typically played to 5 points but sometimes can be played to 10. Watch a human foosball video to see a live game in action. 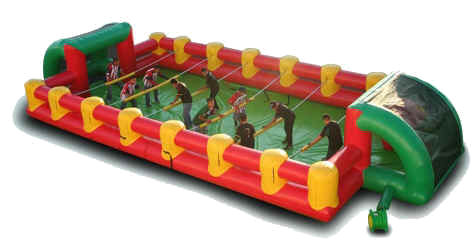 While FoosballSoccer.com doesn’t sell or rent human foosball, there are a number of companies that typically rent the inflatable version for corporate events, church gatherings, youth events, birthday parties and other parties. These companies aren’t endorsed by us but we have put together a list if you live in any of the locations below. If you can’t find your city, search for “human foosball rentals” along with your city on Google and you will likely find a company that has one. If your budget can't afford one of these, you can play life-size foosball by just creating zones where players must stand and can't walk across. Then just give them a long pole to hold on to so they have less range of motion. This is less fun and realistic but might be an alternative for some.